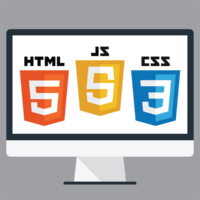 What this course does well, compared to many other HTML instructional sites, is use examples and assignments that put everything in context. The first assignment has you building a responsive web layout right off the bat, while the second uses Bootstrap to show you how it simplifies much of the CSS and lets you add new features. It also covers topics like setting up your development environment, using github, browser sync, and even visiting with a client to determining design specs. The only downside is the pacing in the last week where they cover DOM manipulation, JSON, AJAX, and dynamically loading content. While they go over it in the lectures, none of it is really required for the final assessment. The week four assignment has students simply output some text to console, while the week five involves editing a few lines in the Chinese restaurant site that is a good exercise in reading through a pre-existing code base but doesn't include much if any of the content from the week five lectures. Overall, the course was a refreshingly well structured and scaffold-ed introduction to web page development. Even knowing a lot of the basics going into this, I still feel like it helped solidify and teach me a bit more on the subject. Accomplishments: I scored 100% on the quiz and all four peer graded assignments. You can find the resulting web pages for these assignments here. This entry was posted in CourseReview and tagged Coursera, CourseReview, Education, Programming, Ruby. Bookmark the permalink.